This week has been full of exploration and experimentation. We started by trying a few different experiments using bicarbonate, vinegar, lemon juice and food colouring. We read through our experiment book and the children made predictions on what they thought might happen when we mix the ingredients together. The children chose their containers and carefully measured in vinegar to half way. Next we were going to add the food colouring. 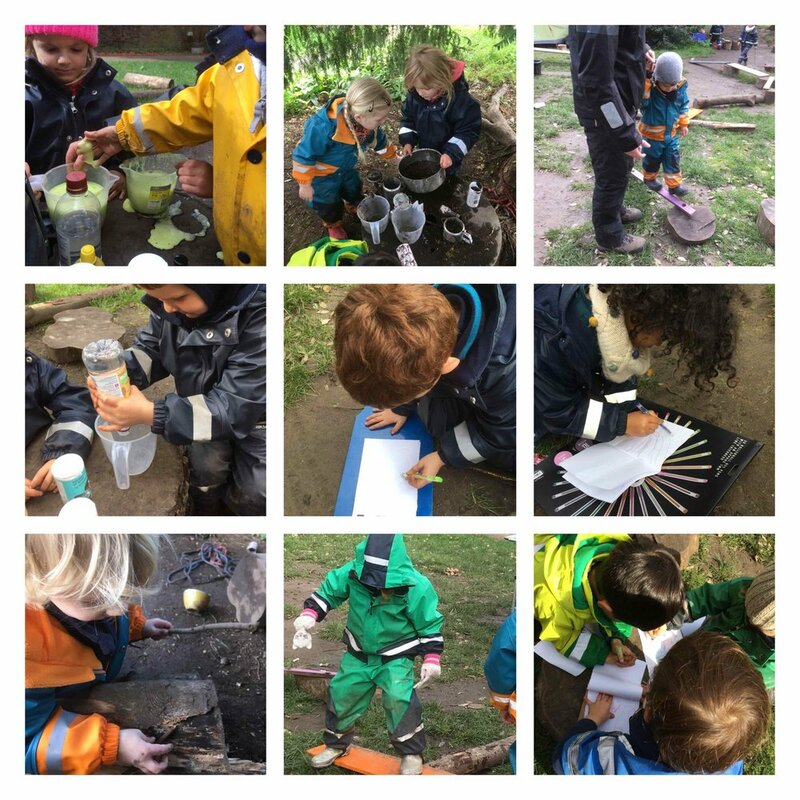 The children thought about different colours they wanted to try mixing and watched as the colours whirled together in the water, shouting excitedly as a new colour was created. Next we added the lemon juice and then the bicarbonate, the children excitedly called to their friends to come and see as the mixture erupted. 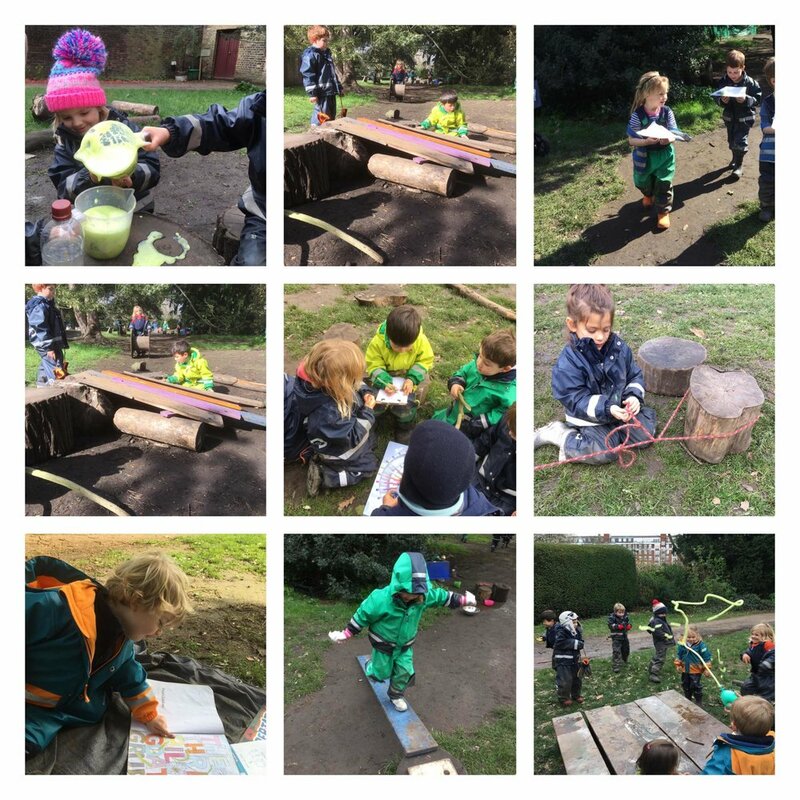 The children were very focused throughout – measuring ingredients, mixing colours and creating concoctions until all the ingredients had run out but the children didn’t let this stop them and continued to add ingredients they found from the natural world. They added mud, leaves, petals and sticks but were disappointed that nothing made it erupt like the bicarbonate. They went on to use the potions they had created to inspire their imaginative play, decanting them into the small bottles and becoming wizards, witches and baddies. The children have been very creative this week using their new gel pens. They discussed the variety of colours and spoke about how some of the pens were a bit spooky because they were glow in the dark. The children discussed between them what they had chosen to draw and one child exclaimed they had made an aeroplane, having folded up the paper. Many other children decided they would also like an aeroplane and we made lots of aeroplanes! The children used the gel pens to decorate their aeroplanes and write their names on so that they didn’t get mixed up. We continued to make aeroplanes throughout the rest of the week, we made a variety of sizes to see which flew the furthest. As the week went on the children created increasingly extravagant designs and the planes flew further and further. Some children began constructing platforms to stand on so they could make their planes fly even further and all the way across the crocodile river! The children worked together to build these platforms and took turns to use them. Throughout the children discussed distance, height, size and speed.